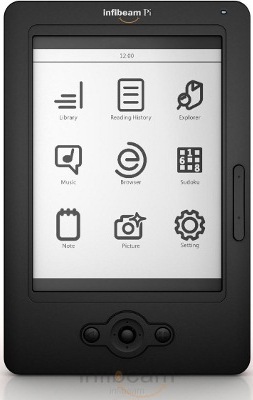 Ecommerce firm Infibeam.com has begun shipping the next version of its ebook reader Pi. Pi Square, as the new device is called, has two new features - it now has Wi-Fi and has a touch screen. "With Pi Square, we have included touch and connectivity on the same device. Touch comes naturally for the majority of our users in India and we found that our users were touching the screen intuitively. So we decided to bring that to the next version of Pi," said Vishal Mehta, CEO and founder of Infibeam.com. Infibeam has been working on this version since the release of Pi 10 months ago and has fixed the pre-order price at Rs. 11,999 compared to the previous version's MRP of Rs 9,999. Other changes to Pi Square include design modifications to the motherboard and the screen which was developed by Infibeam engineers. "What we did is place a touchscreen on top of the electronic ink screen. There have been many attempts to make make them into a single membrane and patents have been filed too. The issue many face with such a combined screen is that microcapsules below an e-ink screen can break if you 'touch' the screen too hard. So we added a screen to protect it," said Mehta. Infibeam does not have a patent on this layered screen and continues to source its touchscreens from the same Chinese/Taiwanese vendors. Wi-Fi and not 3G has been chosen as the company believes that users would not want to deal with multiple data plans and bills for 3G is not going to be inexpensive in the long run, according to Mehta. "If you take a 3G data plan and click on a video by mistake, you can be stuck with a big bill. Also there is the worry of exceeding data limits and being charged more. So instead of this hassle of the bill, we decided we would just stick to Wi-Fi," he added. The Pi2 is loaded with 100 free e-books and ships for free in India. Global shipping is not yet available.